Keep the kids reading this summer. Libraries offer free reading programs with goals and prizes to make it even more fun. There are lots of programs listed here. If you know of one not listed here, please put it in the comments section! Kids through age 12 get a Summer Read SF Book Bag for reading (or getting read to for) 10 hours, and can enter a raffle. Teens (13-18) and adults get a Summer Read SF Book Bag for reading/tracking 30 hours, plus raffle tickets for great prizes. All reading counts toward the goal, including books, magazines, e-books, audiobooks and online reading. 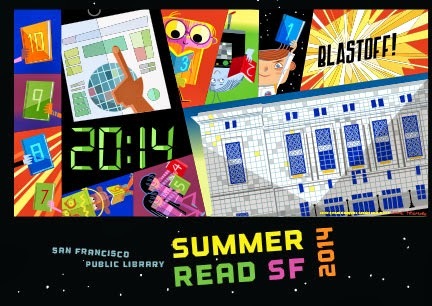 Sign up through a neighborhood library, bookmobile service or online at sfpl.org/summerread. The prizes include museum passes and gift certificates, for children, teen and adult participants. Programs and activities will be held throughout the library system. Yuyi Morales, award-winning children’s book author and illustrator, will be the special guest lecturer for the 18th annual Effie Lee Morris Lecture, This year’s event, “Creating Children’s Books: An Immigrant’s Story,” will be held on Tuesday, June 3, at 6:00 p.m. in the Main Library’s Koret Auditorium. She'll also be at the Mission Branch Library, 300 Bartlett St, to read Niño Wrestles the World, which won the 2014 Pura Belpré Award. This event will be held for children and families. This year they're introducing a BINGO card for kids, teens and adults. You're eligible for prizes and raffles when you complete rows and squares. "Reading is so delicious" was last year's theme for the San Mateo County summer reading program. I couldn't find details yet for this summer. The Santa Clara County summer reading program, Fizz, Boom, Read! runs June 1 - August 31. You'll win prizes for reading and listening to books. Those ages 6-121 who read/listen to 5 books can enter into a drawing to win an iPod shuffle. You need to register online to be eligible. From June 9 to August 9, the Alameda County Summer program includes all ages, even adults, with the theme Paws to Read. Use a game board they provide to track your reading time, and you can win books and other prizes, plus raffle tickets. Also using the Paws to Read theme, you can pick up a reading record starting June 7. The festival runs June 14-August 23 at your local Contra Costa County library branch. Babies to adults welcome to join the festival. Scholastic has the Summer Challenge May 5-September 5, where your child can win prizes, enter sweepstakes and help break the world reading record. They don't actually say what the awards are in the press release (nor on the home page of the summer challenge), so I can't help you there. The website has book ideas, summer reading tips and activity suggestions for parents to help their children read. Log in your reading minutes here and register. This piece was first published on MommyNearest.com.